The primary design concept was for a bridge that traces a sweeping arc and appears to float over the water. The structure responds to its immediate riverside environment, where the banks have a softer edge and the surrounding paths and open spaces are at a more human scale than urban stretches up and downstream. Just over 80m in length, the bridge’s sweeping curves are derived from the unique features of the site itself and the clearances imposed on the structure. The two landing points – the boulevard to the north and a raised platform protected by the river wall to the south – were determined at an early stage. 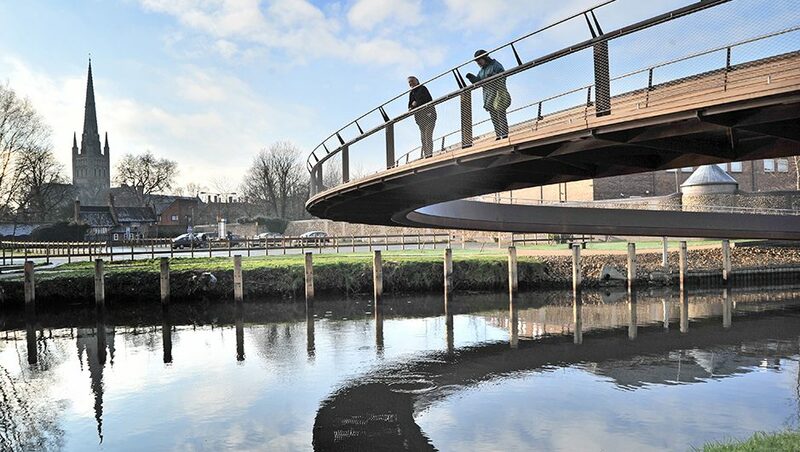 The curvilinear 3D geometry follows the most efficient path between these two points that simultaneously accommodates clearances for both river traffic and the riverside’s cycle way without ever being steeper than 1 in 20, thus meeting high standards of accessibility.